Charming vertical and horizontal lines of the metal structure; the box-shaped house lies along the rectangular plot of land with a grayish-black checker plate acting as a double skin for the wall. The plate prevents heat and also filters sunlight. 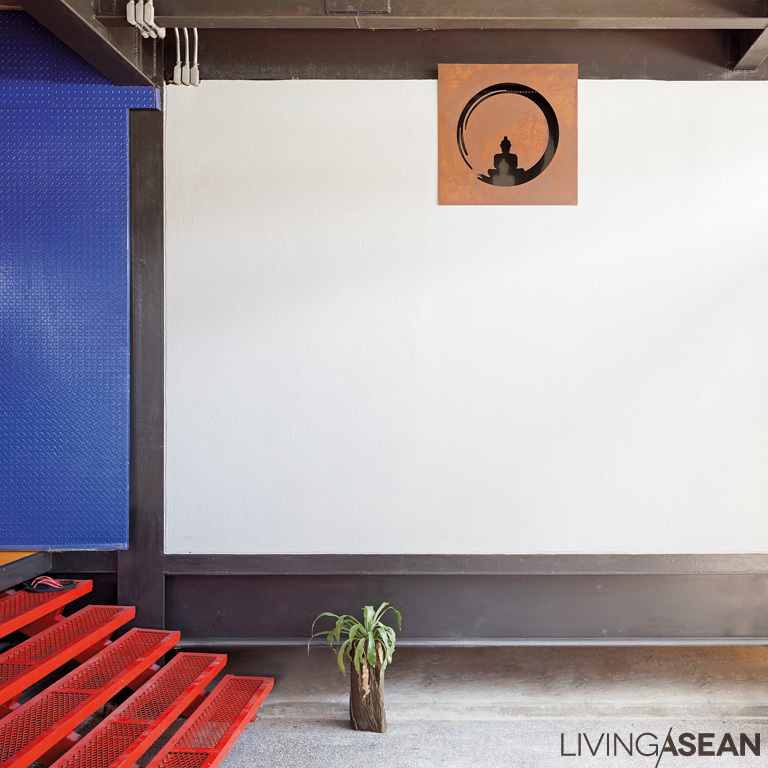 A modern Buddhist altar is made from a laser-cut metal plate, giving a raw and sleek look, which goes well with the house’s materials and linings. Wan chose to work closely with Jun Sekino, his favorite architect who has continued to translate his ideas into reality. “Wan built this house for ‘a little family with two kids” when he was single. It sounded ridiculously dreamy to me. But once finished, Tinman reflected both the raw house and the owner’s character.” Jun Sekino commented. 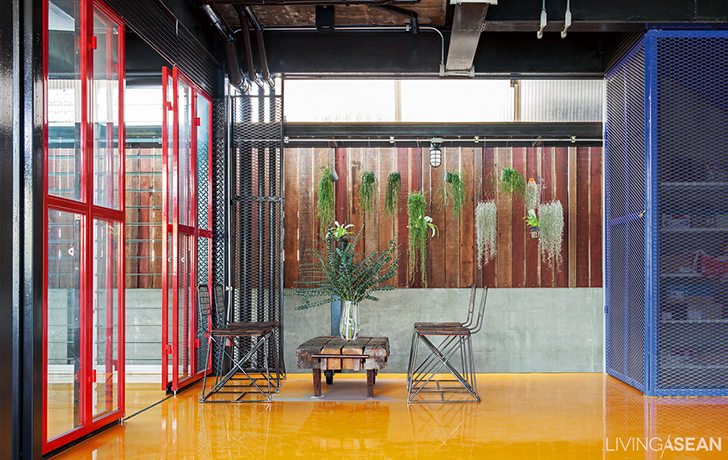 The open entranceway adopts traditional Thai-style slit flooring. The outcome is an airy area that doesn’t have to rely on an air-conditioning machine. And the rectangular house of 415-square-meter utilizable space has taken its shape. Its stairway works as a core ventilation stack. The linear interior hallway distributes functions to each room. 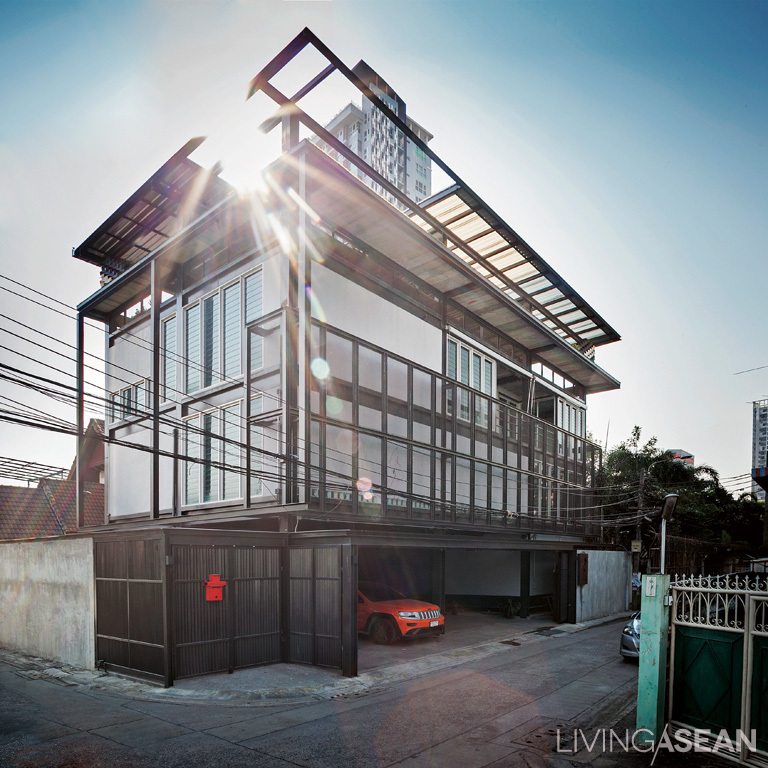 The first floor consists of a carport, a living room, dining room, kitchen and entertainment room. The second floor is divided into a library, workroom, dressing room and guest bedroom. The third floor consists of a master bedroom and children bedroom. 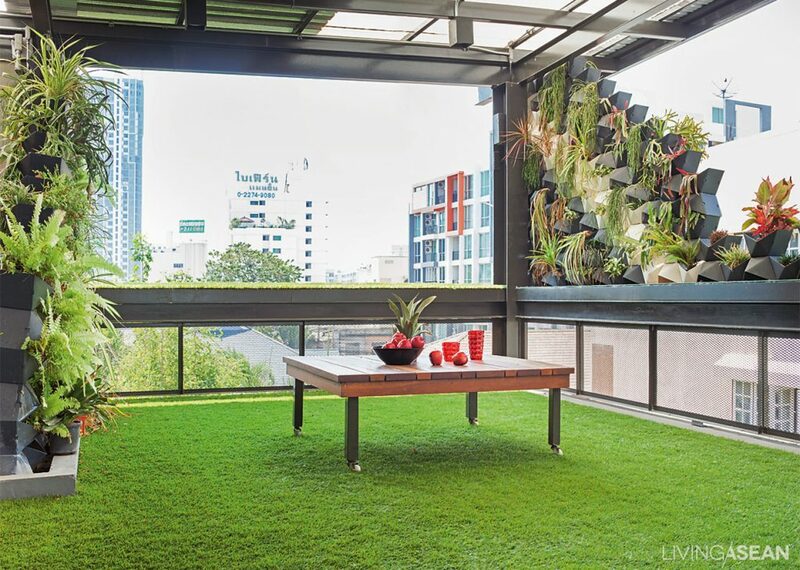 On the fourth floor lies a garden with a lounging corner. 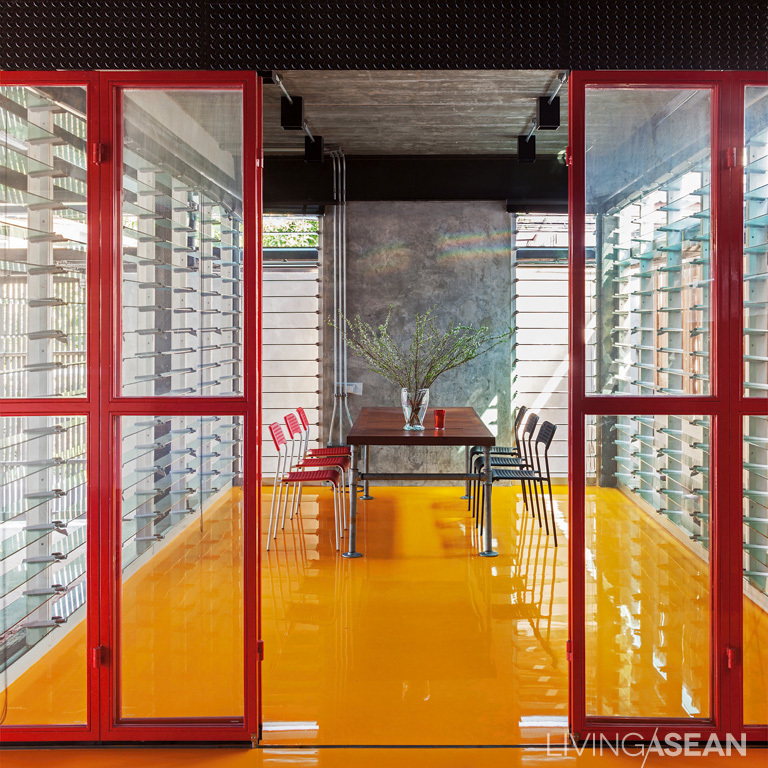 Bright yellow epoxy flooring in the dining room; the color is chosen to encourage an appetite. A mirror panel connects the dining room to the living room. Louvers are installed from floor to ceiling. So, the wind can flow through and the view outside can be seen. The design is based on form-follows-functions and ergonomic concepts. The owner took part in every step of the way. He questioned every details while the designer adjusted the plan according to his needs. 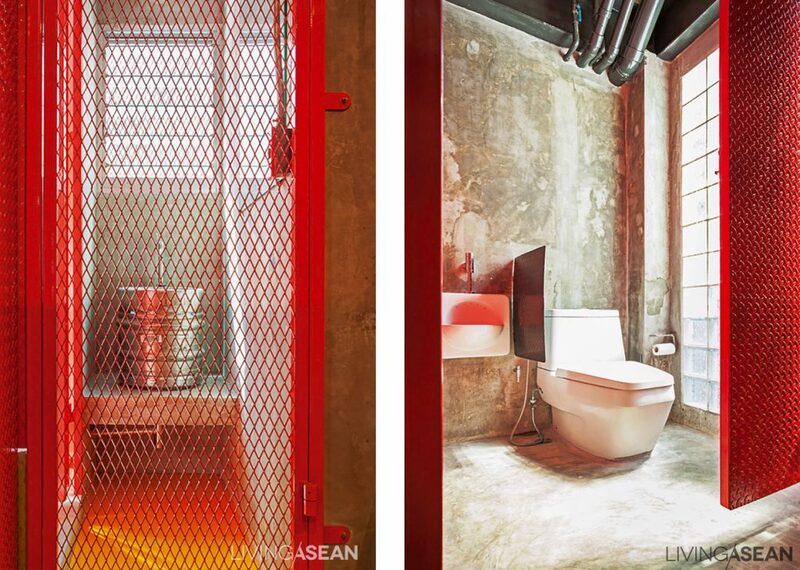 Minimalist design appears not only in its look, but also in the house’s functionality. There are no door knobs. Instead, bolts are applied for every door in the house. 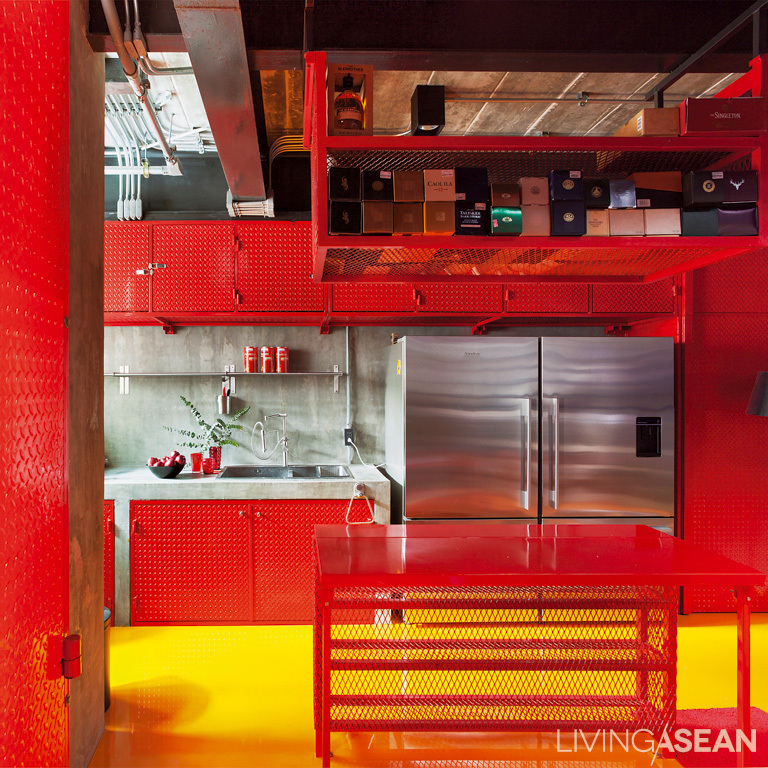 The red kitchen combines a striking color with a raw, industrial style. The kitchen counter is made of polished concrete. Inside is a built-in checker plate closet. The decoration is done in loft style. True nature of materials is shown. Wood from the old demolished house are adapted into a gigantic bookshelf (the size of 0.60 x 29 x 3 meters), a work desk, a bedside table, flooring and so on. Custom-made built-in furniture is arranged. The pieces are made from industrial supplies, for example, water pipes, metal plates, expanded metal pieces, and checker plates. 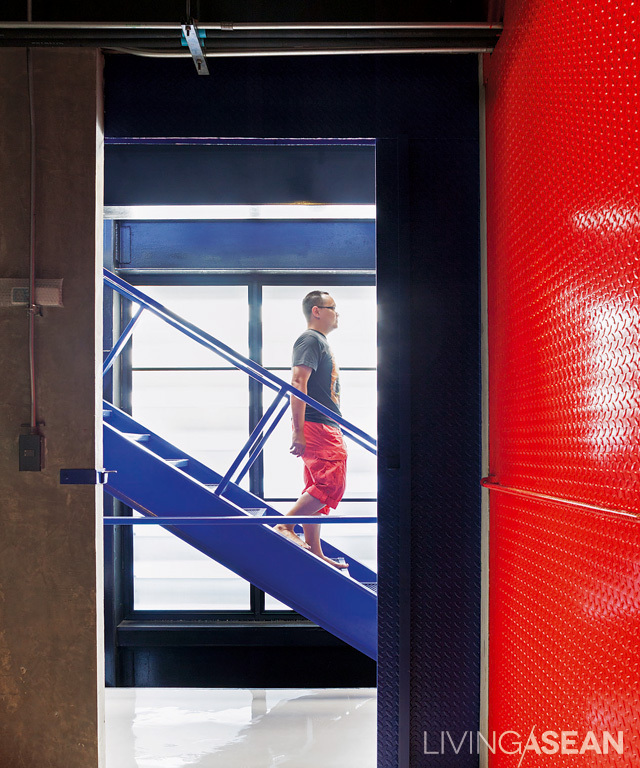 Primary colors freshen up the house — red, yellow and Majorelle blue. A guest bedroom is ready to welcome his “Don’t Drink and Drive” friends. 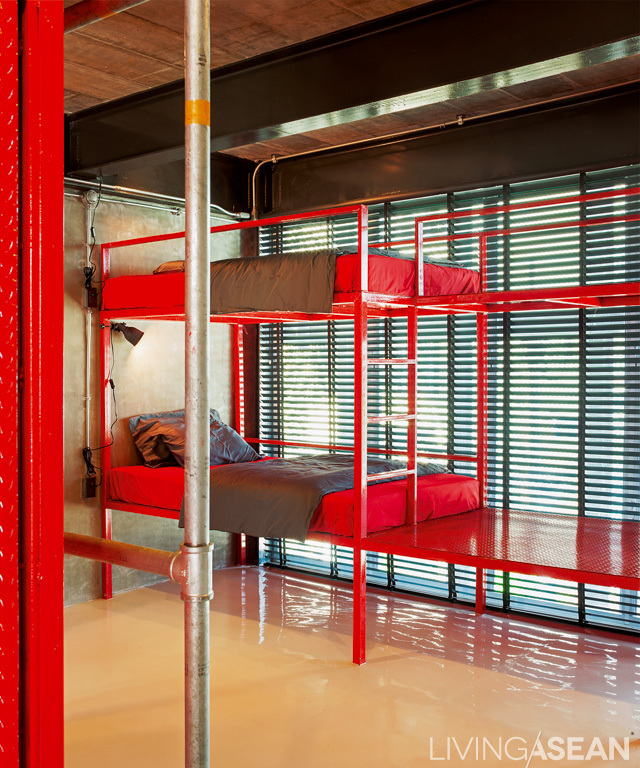 A metal bunk bed comes with a 4-ft mattress wide enough for two people to sleep in comfort. The exterior shape of this house is clear and simple, while interior design is lively and fun. All of the functions are inter-connectable and serve everyday need. It’s a perfect home for a modern family. Chic checker plate door adds an airy feel to the dry part of the bathroom. Polished concrete finishes are paired with a silver bucket to make a set of sink and counter. 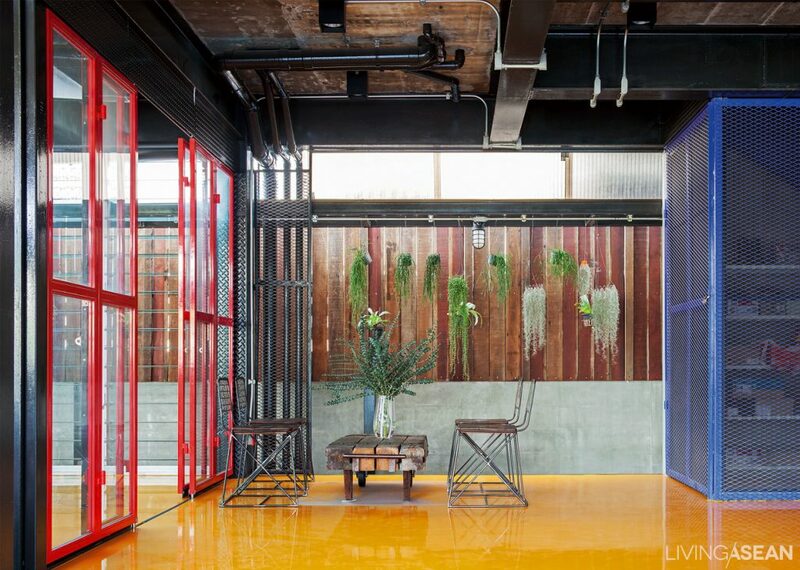 /// A red custom-made metal door breaks the rawness of unpainted concrete. “I travel a lot. But when I’ve got a chance to stay home, I’m so happy. I love every corner in this house. Each of them is designed having me as its center. I believe that this design is timeless. Even in the next 20 -30 years, it will always be a contemporary one.” Wan said. 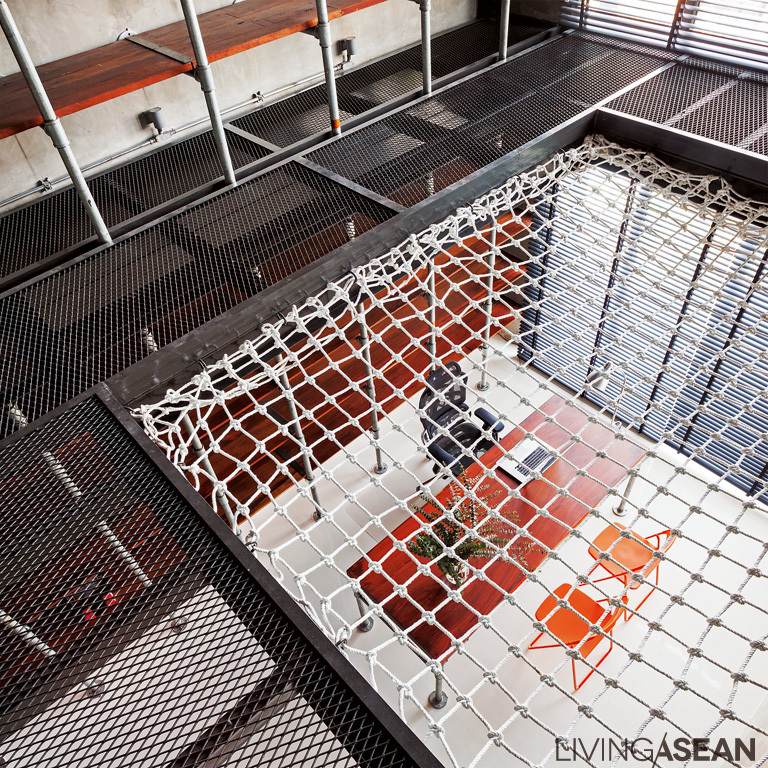 View from the library on the third floor looking down to a workspace on the second floor — A huge rope net is hung in the middle of the room for a relaxing reading moment. The wall on the west side has a tall bookshelf, which also serves as thermal insulation. Wan was so impressed with the Majorelle blue color from his Morocco trip that he selected the tone for his stairway. Master bedroom decoration is simple. Wood floor creates a warm, relaxing atmosphere. 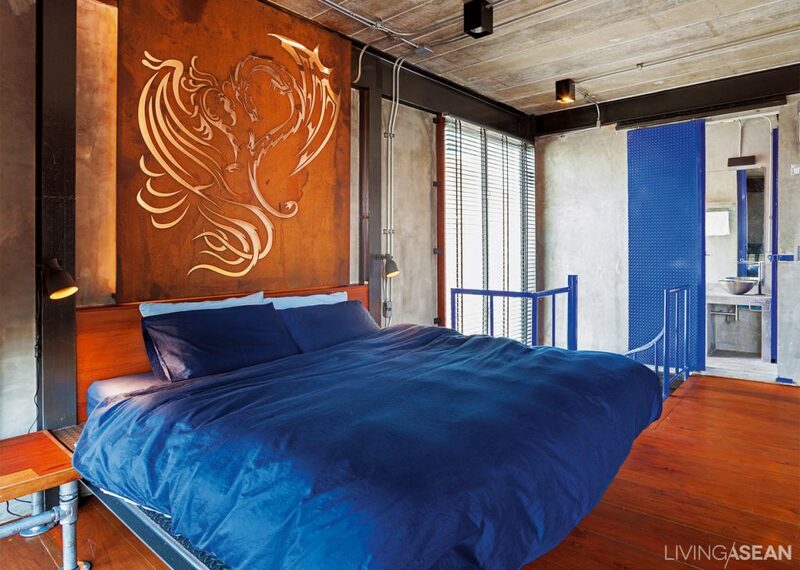 The headboard is adorned with a dragon and swan laser-cut metal sheet. Wan designed the metal bed himself. 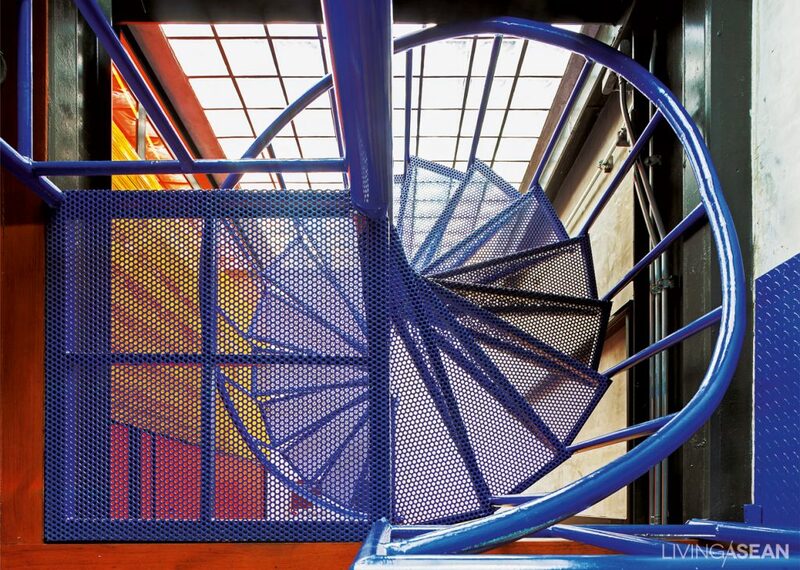 The Majorelle blue spiral staircase connects the dressing room to the bedroom on the second floor. The delicate lines come with great functions.